Picture from the preview by Henk Timmerman. 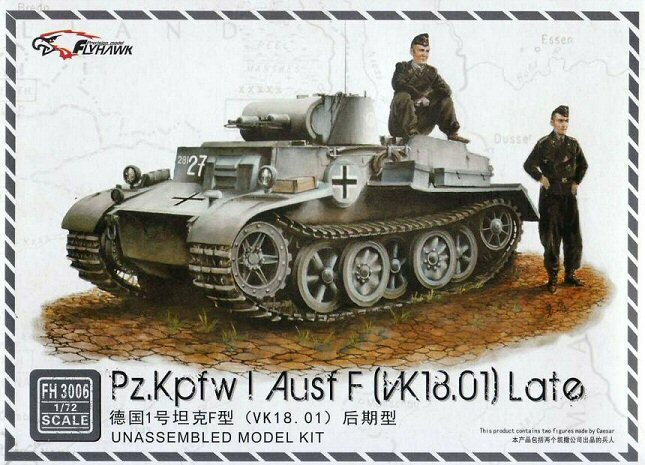 While most modelers are familiar with the Panzerkampfwagen I Ausf.A and Ausf.B, the Ausf.C (VK 6.01) and Ausf.F (VK 18.01, also known for a while as Pz.Kpfw.I Neue Art Verstärkt) are somewhat more obscure. 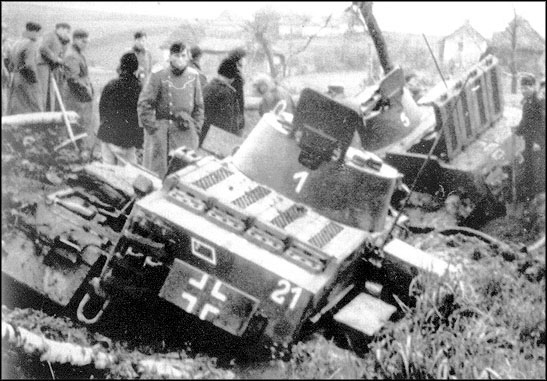 Even though all four Ausführungen shared the name "Pz.Kpfw I", the Ausf.C and Ausf.F had very little in common with the Ausf.A and Ausf.B, or with each other for that matter. 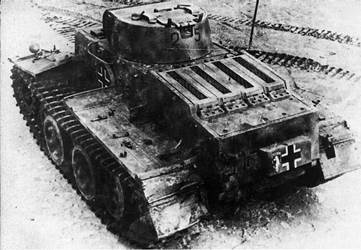 The Ausf.C was meant as a very fast light tank, while the Ausf. F was meant as a very slow and heavily armored AFV. 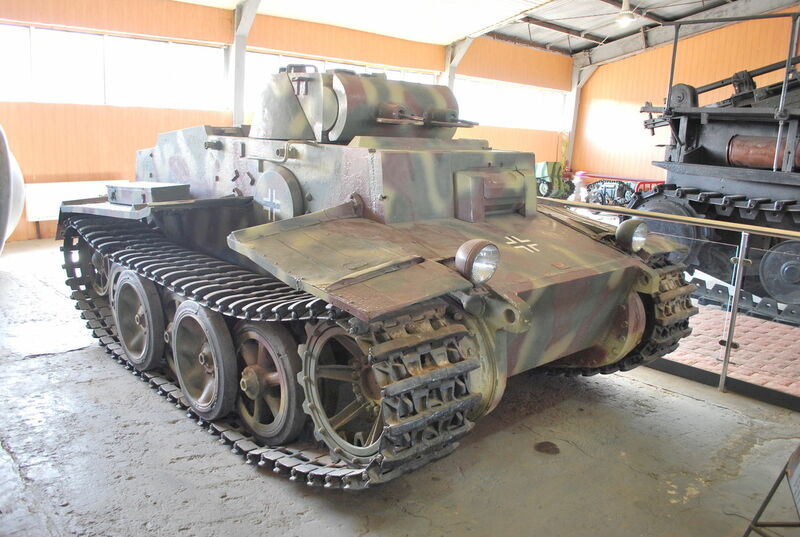 If the Ausf.F had anything in common it is with the Pz.Kpfw. II Ausf.J (VK 16.01), which, incidentally, Flyhawk has annouced as its next kit. 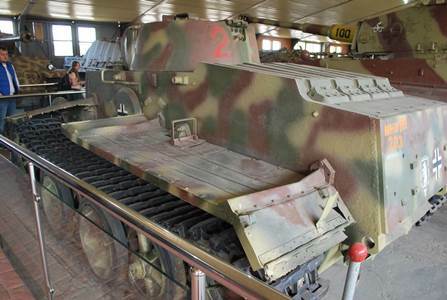 A Versuchsfahrgestell (prototype) and thirty 0-Series vehicle were built in 194, while the 100 1-Series vehicles that were originally ordered were cancelled before construction started. These vehicles were used by 1.Kp./Pz.Abt.z.b.V.66 (attached to Pz.Rgt.29 of 12.Pz.Div. and later renamed as its 8.Kp. 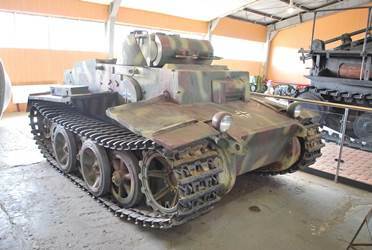 ), Pz.Inst.Abt.559, 2.Polizei.Pz.Kp. 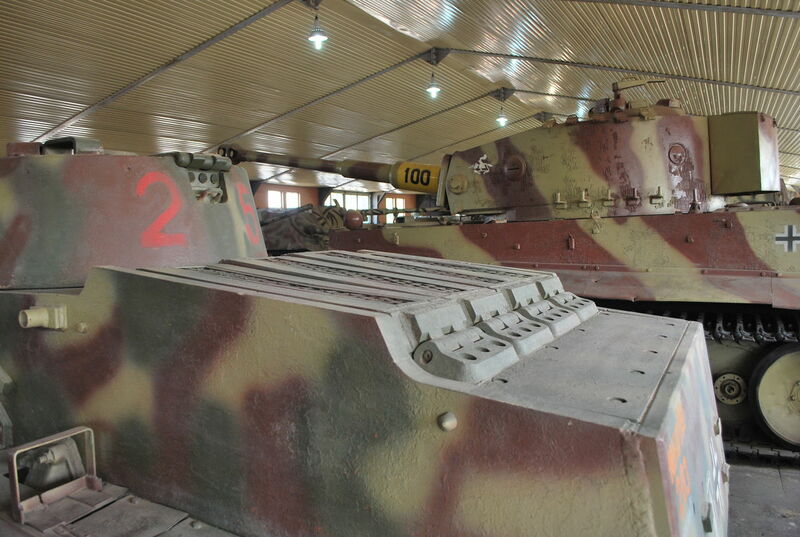 (neu) and Pz.Rgt.1. 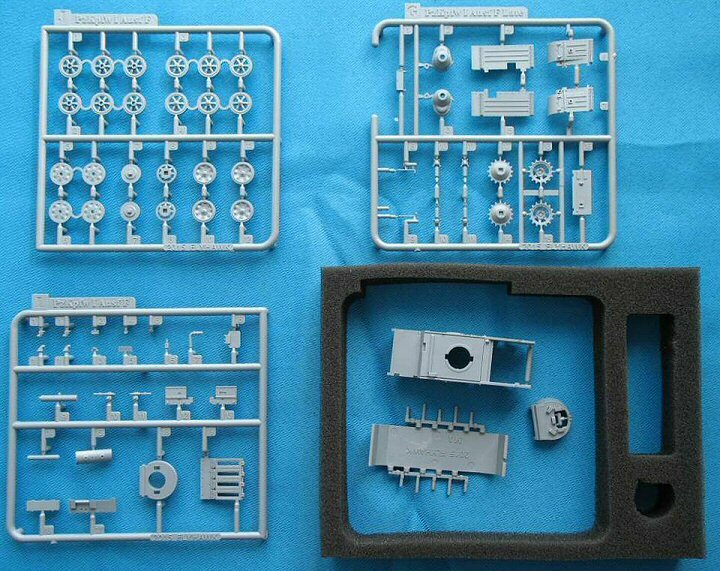 Even though this is only the third kit by Flyhawk (the first two were FT-17s), the company has already established a solid reputation for highly detailed kits. Even modelers that are not familiar with the company will be suitably impressed by the packaging of the kit. 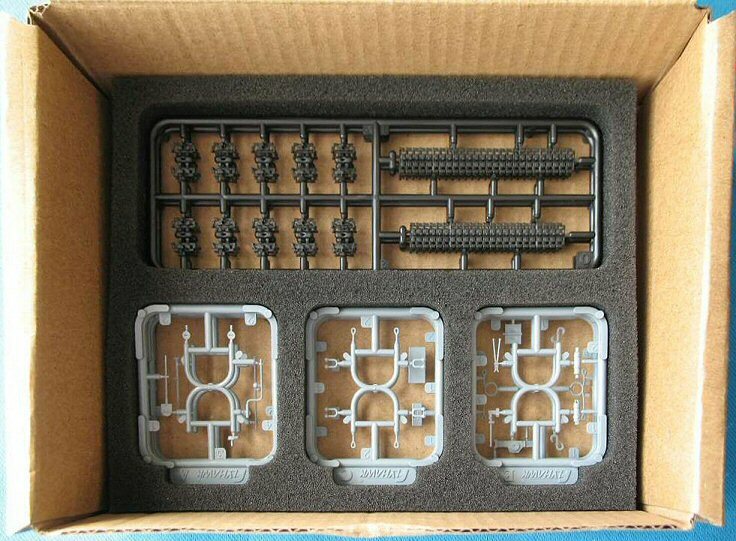 The boxtop is nice, but more impressively, the kit comes in a very sturdy cardboard box with the individual sprues protected by foam cut-outs. 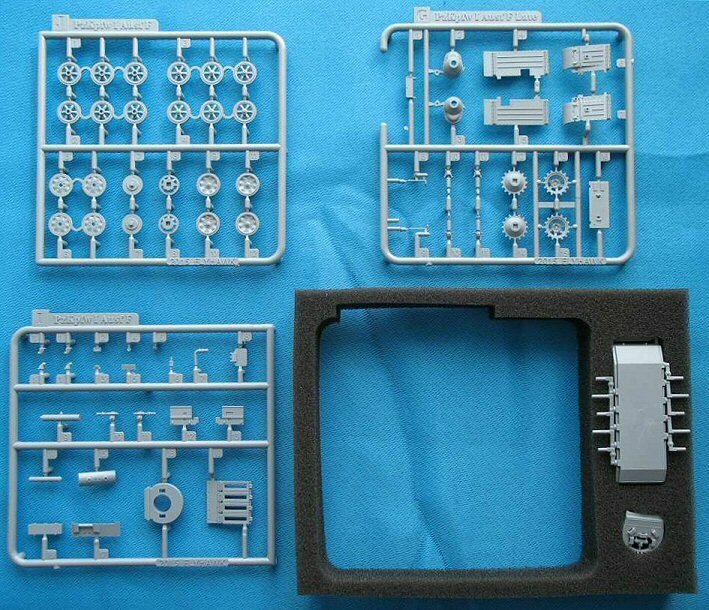 More scans of the parts can be found in the preview of the kit by Henk Timmerman. So far I've finished step 1 of the construction sequence, and I must say the fit is perfect. The way the kit is engineered opens the way for anyone that would like to add an engine and I am wondering at this point if I should have painted the interior of the engine compartment, even though I don't think much will be visible after the meshes are added. The visor (part I-5) is installed, and the instructions are not very clear where to put it exactly. In fact, being a separate part, the modeler can choose to put it in the open or closed position. Closed is just as low as it can be placed; open would put the upper edge just below the centerline of the binocular sighting ports of the driver (see picture), meaning that it slightly overlaps these holes. The muffler is added to the rear, and I am not sure if the etched part for the shroud is an added value as I had difficulty bending it to (semi-) tubular shape. We will see how much is visible once the rear hull plate is in place. It would be a good idea to paint the area around the muffler black at this point, as it will be difficult to access this area once the hull is closed. At this point, I have let the plastic periscope cover above the driver in place, as I am afraid that the etched alternative part will be eaten by the carpet monster if installed too soon. Note that, if you choose not to use the etched part and want to install the vision block, now would be too late. It would be best to install this before mating the hull halves. At this point, I compared the basic dimensions against plans in , and if my measurements are anything to go by, then this kit is as close to 1/72 in all major dimensions as can be. Moving to step 2 and 3 of the manual, I started to stray from the proposed building sequence, leaving off smaller parts for later. The suspension is made up of a lot of individual elements: shock absorbers, bump stops, etc, which all have a very high level of detail. I guess the way the kit is engineered might allow for an articulated suspension, although a little surgery will be in order. At this point a single sink hole was found in the idler mount, which will be hidden by the tracks. I also discovered that the rear hull plate will stay in place without glue, allowing access to the exhaust. It is just an example of how well this kit goes together. 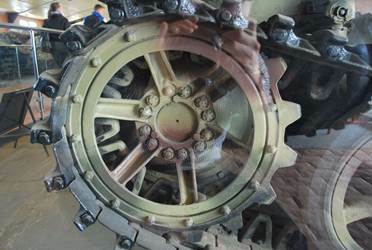 In the pictures below I dry-fitted the roadwheels, sprocket, idler and turret. (The idlers are not perfectly aligned yet.) 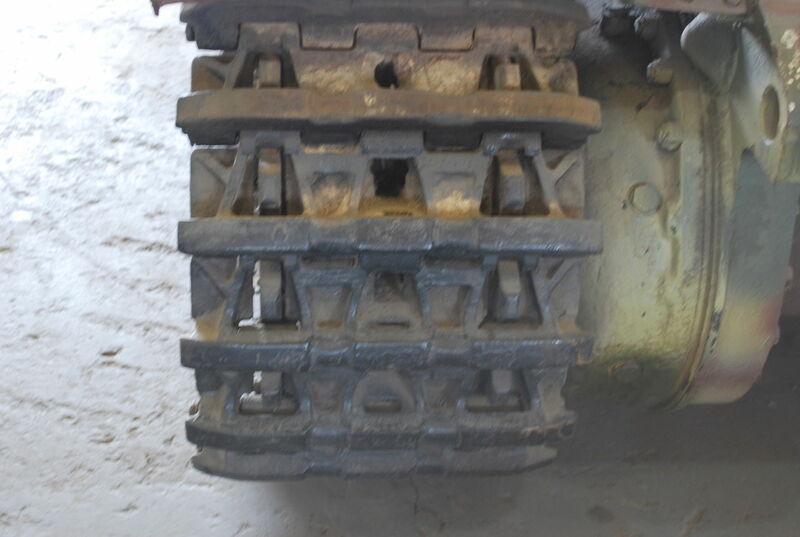 The interleaved suspension is done in the (by now) classical way of connecting a row of wheels with an arc that ensures perfect alignment. I again compared the look of the kit against pictures and plans in  and found no mistakes. Flyhawk even captured the slightly different layout of the bolts between the left and right drive sprocket. As it will be difficult to paint the area behind the roadwheels once the tracks are in place, I painted this area first after having decided to go for the dark gray painting option. As mentioned earlier, the roadwheels are given in the "neo-classical way", being connected by arcs. Up till now, all manufacturers that have chosen this approach have presented their roadwheels in exactly the same position, which doesn't look entirely realistic. 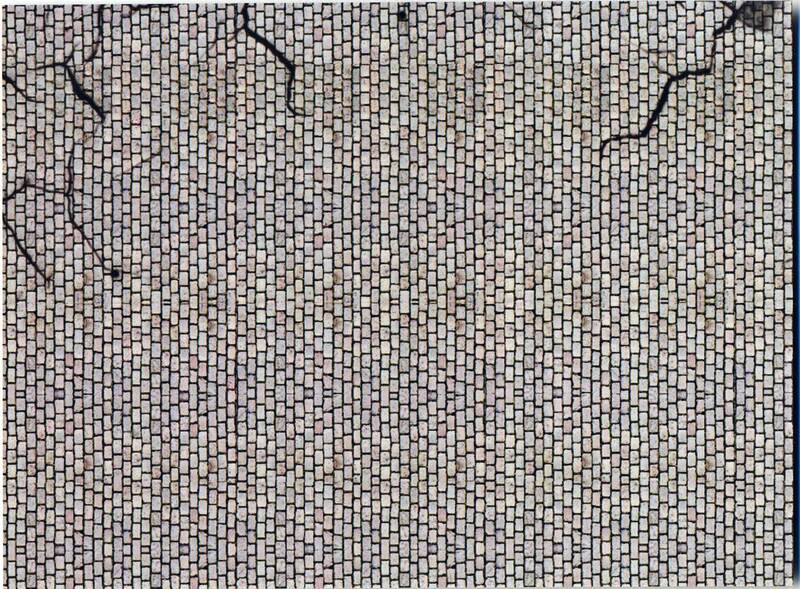 I therefore decided to sever them and install them individually, taking care that pairs of roadwheel halves are aligned. The fit of the wheels on the axles is so tight that it doesn't pose a problem to keep them in line while adding realism. The tracks have a level of detail that I haven't seen in any other kit. Track faces are very crisp, track teeth are hollow (!) and individual tracks pins are represented. The individual links actually click into these track pins. The fit of these is tight, so tight that working track links are starting to appear on the horizon of possibilities. Flash is nowhere to be found and as the tracks are given in dark gray (the rest of the kit is light gray) they will not require much painting, perhaps just some dry brushing and weathering. I measured the roadwheels and tracks against  and found them all to be within measuring tolerance of 1/72. I also noticed that the tracks are made from a somewhat softer plastic than the remainder of the kit. This is probably to allow the fine detail to be cast, but it also means that it is quite easy to deform the individual tracks when one doesn't take gentle care of them. 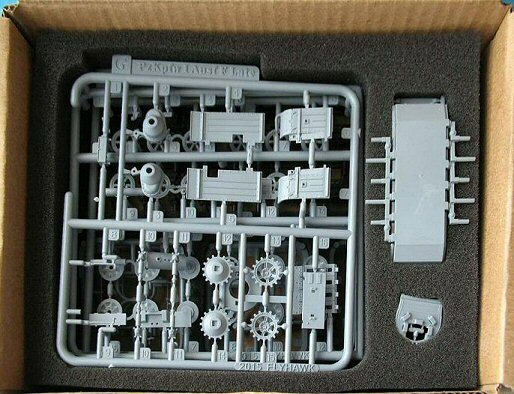 The modeler will also need to use glue sparingly as the plastic dissolves rather easily in most types of glue, especially MEK (this goes for all parts in this kit, by the way). Then again, not much glue is needed as the fit is good enough to have the tracks stay in place with the fewest amount of persuasion. 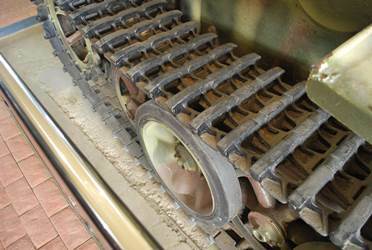 As with all tracked kits, getting closure is always a hit-and-miss affair. While the right track demanded an integer number of track links to get a around the whole suspension, I ended up with a rational number on the left side. I have no idea why this happened as both the left and right side seem to have the same dimensions. Severing the idler from its axle and moving it a quarter of a milimeter more to the rear allowed me to insert the last track link. Even with the two links needed as spare tracks on the rear hull, I still have 8 track links left. As a lot of manufacturers give just enough track links to have one too few, this comes as a relief. Actually, if Flyhawk, for some reason, would specialize in manufacturing tracks of this quality as separate sets, they might prove very popular. After the tracks were fitted, the fenders were put in place. In this area the instructions let you choose to install the two boxes on the left rear fender or not, without being specific when you should use them. Both color schemes in the painting guide show them, but if my references are anything to go by it seems that the first marking option (the three-colored one) didn't carry them, while the gray one did. The boxes and tools that go on the rear fenders might be a smidgen too big for their own good, or I might not have placed them all exactly where they were supposed to be, but I ended up with a rather tight fit. Perhaps dry fitting them first more thoroughly might have been wise. I also managed to break two parts (the crowbar and crank). The former was repaired easily, but the latter had the broken bit fly off and end up in geostationary orbit. It wasn't that hard to recreate from sprue and both broken bits were mostly hidden by the box that went over them (at least in my marking option), so it wasn't a big deal, but care is clearly called for with these pieces. Later I also broke the mounting stub of one of the headlights. The carpet monster wasn’t heard complaining. I also chose to go with the plastic tow ropes, even though the alternative (separate eyelets and string) might have looked better if ever I managed to assemble those faultlessly. I was acutely and momentarily lacking in self-confidence for those parts. Note that (as the manual indicates) only one tow shackle was fitted, even though I find this surprising and two are given on the sprues. One of the two boxes for the fender had the edge under the lid enhanced by scribing it with the point of my XActo and one of the openings for the visors was drilled out as it was partially flashed over. The other one was drilled out to the exact same dimension to match the other one. Note that the turret hatch has some detail on the inside and is a separate piece, meaning that a minor amount of scratchbuilding will allow the modeller to have an open hatch. Also note that in the turret area it is possible to install the gun shield upside down. Pay attention as the flattened side goes on the bottom. The wooden jack block was also slightly enhanced by scribing some wood texture into it. 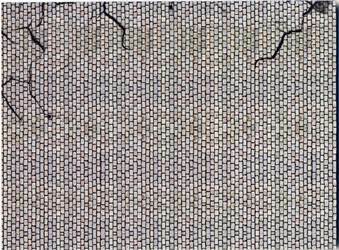 Any texture is surely overscale, but will look good regardless. At this point most of the construction is done, apart from some very small parts and the PE. At this point not much was left to be added, apart from the majority of PE and some very small parts. There was a time when I embraced PE parts with reckless abandon; being a bit older, I have become more sceptical and I am not sure, given the quality of the casting in this kit, if a fair amount of parts that are now only done in PE could not have been rendered in plastic (or both, so the ham-fisted modelers, like me, can still decide). Obviously, had I made that decision earlier, I would have added the actual visor blocks from the inside, made from clear acetate. Now I am left to ponder how I will do that with the hull and turret closed. The meshes all fit very well and are a real improvement over anything we could get in plastic. They are held in place with varnish. The frames that are supposed to hold the spare tracks in place are a pain, and I would have preferred if Flyhawk had given us a kit part representing two track links with the holder integrally molded. After various tries to get the PE parts to wrap around the links, I ended up using only the front section of the PE and strips of plasticard to close the gap with the hull. Next time I won't even bother with the PE and go for an all-round plastic approach. By the way, two rectangles are molded onto the real hull that need to be removed according to the instructions. Why they are there in the first place is anybody's guess. I decided to use the PE holders for the tow rope even though I kept the plastic tow ropes. Perhaps not the best choice either as these angled iron profiles stand a bit too proud of the hull in my opinion. Keeping the plastic stubs on the hull and an extra small plastic strip might have been better. What might have been better still would be plastic tow ropes that come with the brackets integrally molded. I gave up on trying to use the PE parts that hold the rear lights and resorted to a piece of scrap plastic. All the PE for the turret was used as prescribed, except for the visors. Vertical slits were engraved into the horn (I-3), while the MGs were drilled out with the finest drill bit I could find. The box for the left fender (D-2) was raised with four stubs of plastic as otherwise it would just sit loosely on top of the tools. The antenna base (to the right and rear of the turret) was drilled out in anticipation of receiving an antenna, which is not included in the kit (and not mentioned in the instructions). Flyhawk gives two marking options. Well, not quite, you get four. I'll explain in a minute. The first option is in the late war, three color scheme. I am pretty sure it is the vehicle from Pz.Rgt.1 shown below. It also looks an awful lot like the vehicle preserved in Kubinka (see below). Picture from PanzerSerra Bunker, used for discussion purposes. The second option is a dark grey one, and as for this option you have a choice of three turret numbers, you arrive at a total of four options. Again, I am pretty sure they are the three vehicles from 2.Polizei.Pz.Kp. (neu) shown below. 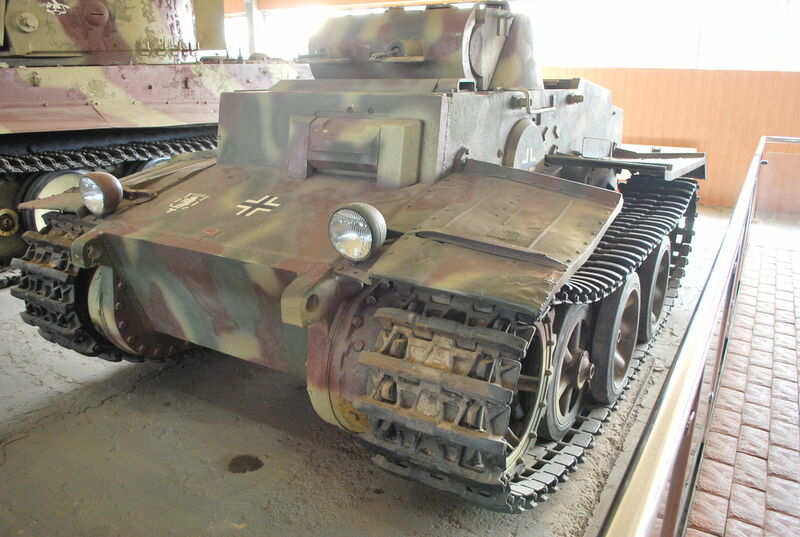 Picture from World of Tanks forum, used for discussion purposes. More pictures of vehicles of this unit can be found here, here and here (thanks to Tim Lau for the info). As you might have guessed, I am going for this option. 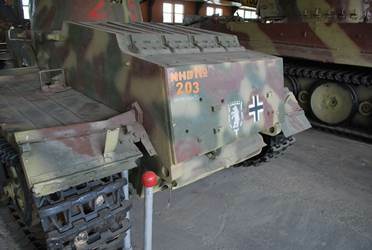 Note that there are decals on the sheet (in casu decal 3, a Balkenkreuz) that are not needed for any option. A bit more annoying is the fact that the decals are not entirely in perfect register. This shows up best in the Balkenkreuze. Admittedly, it's just a little bit, but you easily get used to perfection when building a kit like this. Unless you are very skilled in PE, I believe it would be best to choose the plastic option if one is offered. The decals are very slightly out of register. It's just a very little bit, but if this is an issue for you, a raid on the spares box wil help, even though the bow cross is non-standard. 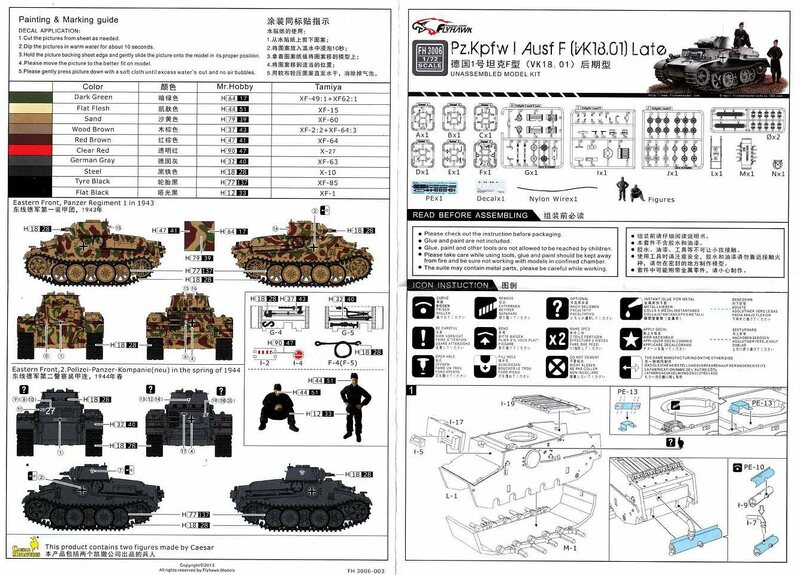 A PzKpfw.II.Ausf.J has been announced by Flyhawk as the next release. 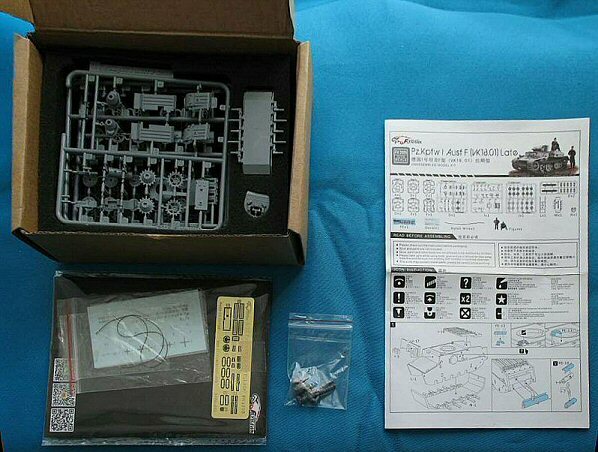 This will share a number of parts with this kit, which means that it will be probbaly of very similar quality. 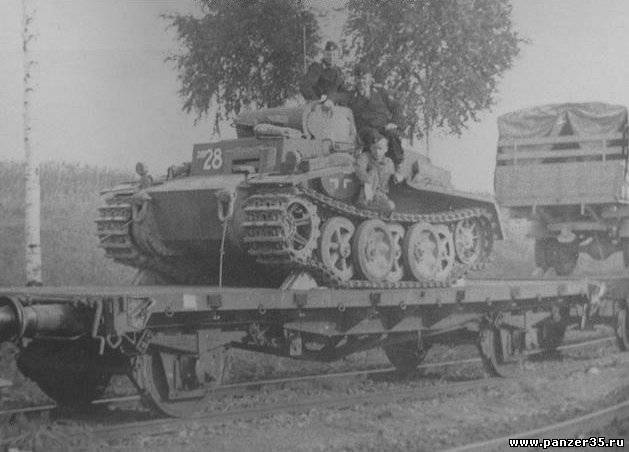 Note that two PzKpfw. I Ausf. F / VK1801 have been preserved: one is at the Kalemegdan Military Museum, Belgrade (Serbia), the other in the Kubinka Tank Museum (Russia). Pictures of the latter are shown below. 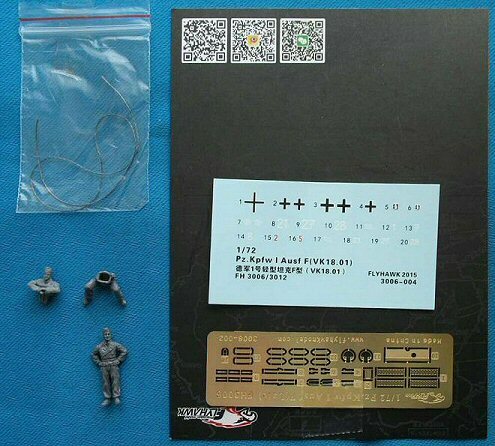 As shown in the preview, two figures from Caesar are included. These are from set HB03, and are very well done. Not mentioned previously is that the backside of the cardboard that holds the tiny parts actually represents a section of cobblestone that can be used to display your model. This is a very ingenious piece of customer service. 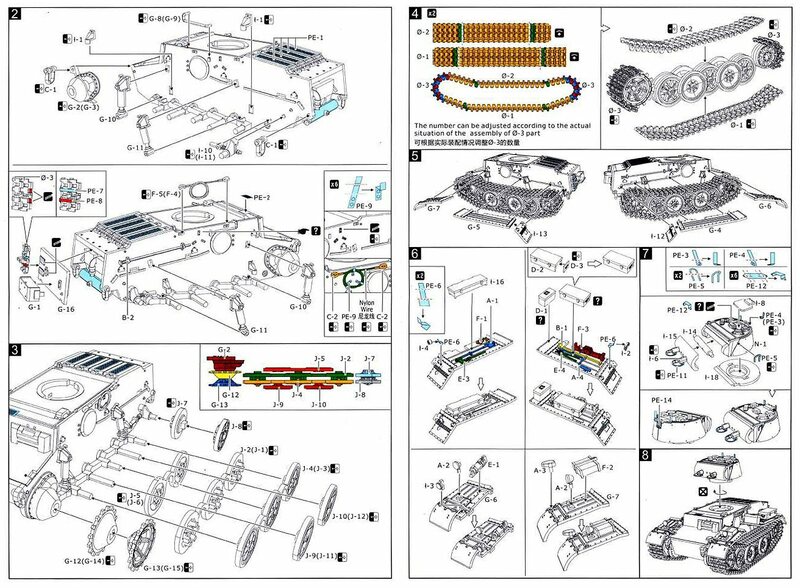 Panzer Tracts 1-2, Panzerkampfwagen I (Kl.Pz.bef.Wg. to VK18.01), T.L.Jentz & H.L.Doyle. Pictures taken by Jakub Oles in 2015 at Kubinka (see below). Note that this vehicle is actually lacking quite a number of items.